Home » Failed Negotiations: Whose Fault? In order to meet with Donald Trump, Kim Jong Un overcame half of Asia. He traveled 66 hours on his armored train, reaching the Sino-Vietnamese border, where he drove into a limousine and, accompanied by 30 cars, moved to Hanoi. Trump appreciated his partner's feat. He firmly shook his hand, clapped him on the shoulder and called Kim a "good fellow." But when it came to real politics, it turned out that they had nothing to talk about in general. Trump and Kim canceled the signing ceremony of the joint declaration, moved the briefing to an earlier date and left the Metropol hotel ahead of schedule. Why politicians could not come to an agreement, the American president told about this at a press conference. According to Trump, North Korea wanted to achieve a complete lifting of the sanctions, and the United States was not ready to allow. In his statement, Trump is clearly holding something back. Yes, Kim wants the lifting of sanctions. But why Americans do not agree? Here is the main question. The US wants the DPRK to make concessions first. That is, the DPRK should cease nuclear testing, destroy its own test sites and hand them over to international inspection. And only after that Washington will begin to lift sanctions against North Korea. Kim is well aware that by abandoning the nuclear weapons that his country has been building for decades, he will not receive any guarantees from the White House. Soon Trump will be replaced by some other Politician and disavows the American-Korean agreements. Actually, this is exactly what Trump did with the Iranian “nuclear deal”. As a result, the DPRK will remain under economic pressure and in addition will lose its nuclear weapons. And without цуфзщты, Kim Jong Un may face the fate of Muammar Gaddafi and Saddam Hussein. Kim understood one lesson that was taught to him and the whole world. As long as you have atomic weapons in your hands, you are safe. Greetings to Libya, Syria, Egypt and all the rest. Therefore, Kim will never get rid of these weapons. Trump wanted denuclearization to be achieved, he would like to have weight for the domestic political struggle. To which Kim Jong-un will never agree. And he is 100 percent right. In his opinion, the solution of the problem in Korea depends on the States themselves - Washington needs to withdraw military bases from South Korea. As long as the American troops are on the territory of South Korea, no dialogue is possible. 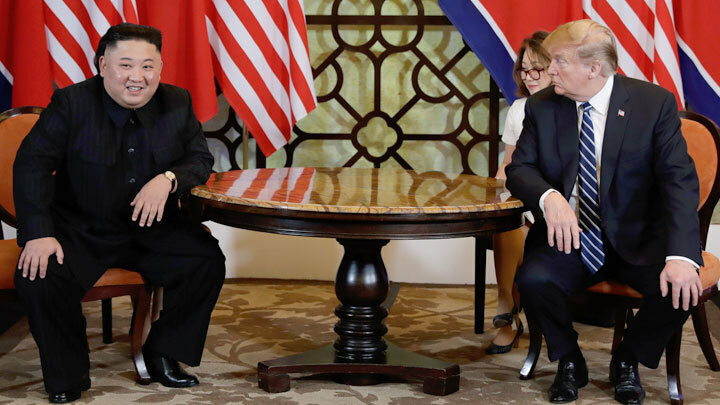 The meeting in Hanoi did not become another “pebble” in the foundation of the expected peace treaty between Pyongyang and Washington, but was perceived by most experts and the media as a “demonstration show”. The culprit of this show was not even Trump, who tried to depict a good face on a bad game, but problems at his home.